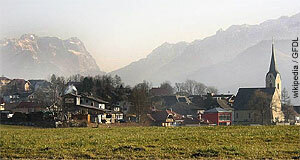 Puch is a community with approximately 4,200 residents and is situated some 10 kilometres south of Salzburg. Puch is situated in the Salzach river valley in the very north of the Tennengau are. The University of Applied Sciences Salzburg (Fachhochschule Salzburg) can be found here in a brand new and modern campus from 2005. This and the recently extended railway link to the city of Salzburg has driven already high real estate prices even further up. Puch is in the process of becoming a functional suburb of Salzburg, with many commuters that live here, but work in the capital. Historically, Puch has been an important community to manage the traffic on the Salzach river and on the roads along the river valley. This has probably been the case since Roman times: Roman milestones indicate the important road between Salzburg (then Iuvavum) and modern Carinthia south of the Alps. This road went through Puch. The castle of Schloss Puchstein was first mentioned in 822 A.D. It was used to control traffic on the river and roads and is still one of the main sights of Puch. However, its current appearance came into place when the building was modernised in the late 17th century. Today, Schloss Puchstein is private property and divided up between several inhabitants. Another noteworthy castle in Puch is Schloss Urstein, first mentioned in a document dating back to the 15th century. Similar to Schloss Puchstein, Urstein was also altered into its current shape by a local noble family in 1691. This very family owned the building until the late 19th century. Today, Schloss Urstein is property of an educational institution and home to the business school of Salzburg University. It is situated right next to the main campus of the University of Applied Sciences. For other attractions of Puch, note the parish church, a Gothic building from the 14th century. The main altar dates back to 1685; in 1735, a Baroque nave was added to the building. Puch also offers good opportunities for sports, hiking and other outdoor activities. The area of St. Jakob am Thurn and the Hinterwiestal valley are characterised by hills with the odd rock, rivers and creeks as well as forests - a very pleasant stretch of land that is popular with people from Salzburg as a recreational area especially on weekends.